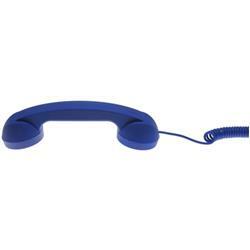 The Moshi Moshi Retro Handset For All Mobile Phones is an exciting, vibrant and colourful device that will most definitely get people talking. 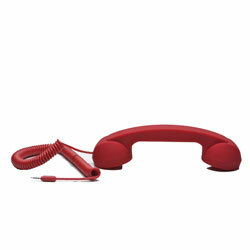 Sleek, slim and stylish, the Moshi Moshi Retro Handset is the latest creation from the brilliant designer David Turpin for the brand, updating a classic design into the iPhone age. 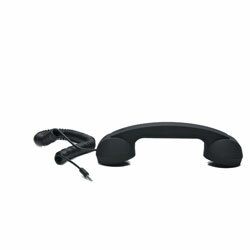 Reducing the amount of phone radiation absorbed by up to 99%, the Moshi Moshi Retro Handset is more than just something that looks nice, it will keep you safe too, especially if you spend many hours on your phone. 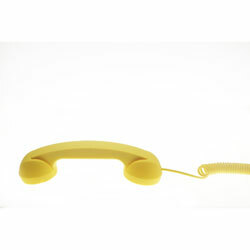 Available in 5 bright and exuberant colours, the Moshi Moshi Retro Handset is the ideal companion to the iPhone but also works brilliantly with all other mobile phones and even your laptop or computer (adapters sold separately). 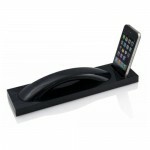 With a luxurious soft touch texture and quality speaker and microphone, there is no excuse for not purchasing one of these unique and exclusive devices. 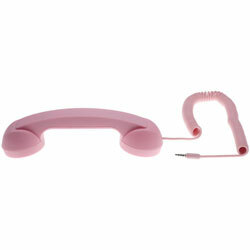 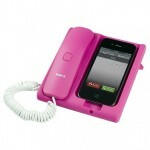 Make your iPhone work better for you with the Moshi Moshi Retro Handset.